« Would You Rather Push on a Rope or Pull It? Over the lifetime of The Breker Trekker, we’ve published numerous posts about the inherent benefits of graph-based scenario models for verification. These models allow you to pull on a rope rather than push it. They allow you to begin with the end in mind, solving backwards to determine the necessary inputs. They support advanced verification planning and debug. They make verification modeling more pleasant. They enable both horizontal reuse over the course of a project and vertical reuse from IP block to subsystem to system. Today we’d like to dig into a particular aspect of vertical reuse that we have not addressed in detail before. One of the goals of verification standards has been to define testbench elements that are reusable. This goal was very much in mind when the Accellera working group standardized the Universal Verification Methodology (UVM). By establishing a standard architecture, nomenclature, and application programming interface (API), UVM components are highly reusable from project to project and even company to company. However, the UVM fails at other forms of reuse. This figure is adapted from the diagrams in the UVM User’s Guide. In accordance with the standard, each interface is connected to a UVM verification component (UVC) that drives stimulus into the design inputs via a sequencer, collects results from the outputs, and perhaps performs some local checking such as protocol correctness. In most cases stimulus across the different interfaces must be coordinated, and this task falls to the virtual sequencer. Checking results also involves knowledge of what happens on multiple interfaces, and most commonly a scoreboard is used to check design outputs against their predicted values. It is very rare to verify the entire design or chip only at the top level. Some level of testbench is developed for most blocks, in this case Block X. This might be an individual IP block, or perhaps a combination of blocks (“cluster”) that’s part of the overall chip. Note that this block does not contain any processors. This means that there is no need to write or generate processor code. 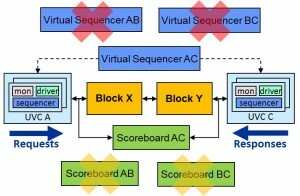 The design can be verified entirely by a UVM-compliant transactional testbench with the verification elements shown: UVCs, virtual sequencer, and scoreboard. Note that UVC B is no longer in the picture since B is now an internal interface between blocks X and Y. It may be possible to reuse some passive parts of the UVC, such as assertions or protocol checks. A new scoreboard is needed to check the results between interfaces A and C. Unfortunately, it is not possible to compose this scoreboard from the two block-level scoreboards since new higher-level behavior must be checked. The AB and BC scoreboards can remain in the testbench, but are usually dropped since they would only re-check block-level behavior already verified. 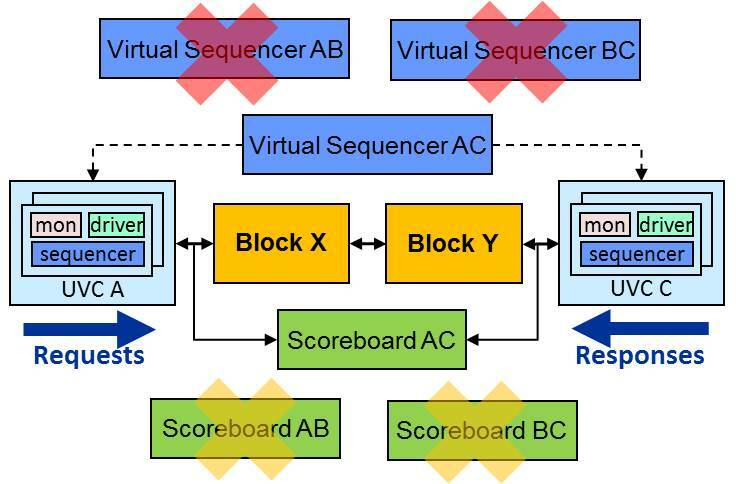 Finally, a new virtual sequencer is needed to coordinate the stimulus generation on interfaces A and C. As with the scoreboard, it is not possible to compose the two block-level virtual sequencers together to form the higher-level testbench element. The lower-level virtual sequencers are useless and must be dropped when blocks are combined. In the process, all testbench “knowledge” of how interface B interacts with interfaces A and C is lost. In a deep sequential design, it may be hard (pushing on a rope) to make desired behaviors happen on interface C from interface A. There is no direct way to reuse the block-level knowledge in the cluster-level virtual sequencer. The shortcomings of the UVM for vertical reuse is one of the factors that led Accellera to form the Portable Stimulus Proposed Working Group. As we’ve discussed, we are very active in this effort and believe that graph-based scenario models are an excellent way to take the next steps beyond the UVM. In our next blog post, we’ll show specifically how graphs enable vertical reuse and how they allow block-level verification elements to be composed at the cluster and full chip levels. Visibility into Running SoC Silicon? Tell Us More! This entry was posted on Thursday, July 17th, 2014 at 5:31 pm. You can follow any responses to this entry through the RSS 2.0 feed. You can leave a response, or trackback from your own site. You hit the nail right on the head with this one, Tom. I’m looking forward to your next post!